The system above is just a set of conditions enabling one person to create music in a certain limited way. These rules are in effect the same as those which govern how a musical instrument is made and tuned. Once these are in place, the musician has the freedom to create their own music. The more systems or instruments a musician has available to them, the greater the scope of music they can create. 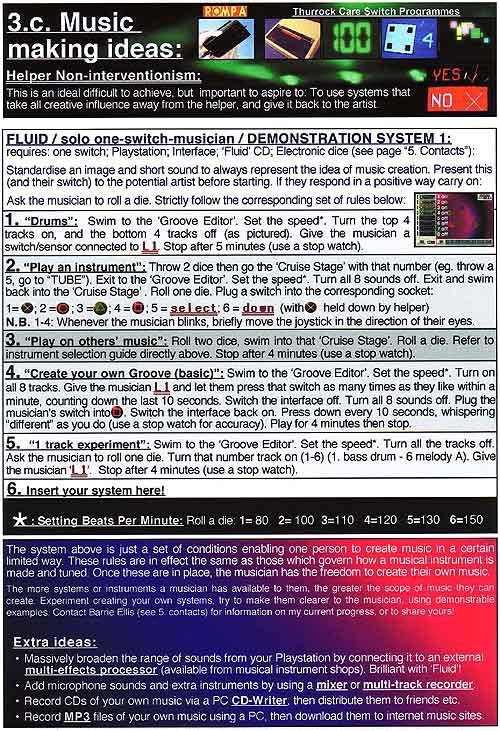 Experiment creating your own systems, try to make them clearer to the musician, using demonstrable examples. Please contact OneSwitch.org.uk for more information, or to share yours!